"Now you young twerps want a new name for your generation? Probably not, you just want jobs, right? Well, the media do us all such tremendous favors when they call you Generation X, right? Two clicks from the very end of the alphabet. I hereby declare you Generation A, as much at the beginning of a series of astonishing triumphs and failures as Adam and Eve were so long ago." Generation A tells a tale of a strange and alternate Earth, one where the bees have mysteriously disappeared. As such, some of the things that we take for granted now are gone, like flowers and apples and such. We are told the story from the perspectives of 5 different people around the world. There’s Zack, a somehow model-esque redneck farmboy from Iowa. Harj, a customer services operator based out of India for the almighty, Abercrombie & Fitch. Samantha, a young New Zealander whose parents declared their new belief in no belief. Diana, a young dental hygienist with a serious case of tourette syndrome from North Bay, Ontario (!). And Julien, a university student/geek who lives to play World of Warcraft from Paris, France. Although all of them are seemingly quite different and diverse, they are brought together after each of them gets stung by the thought-to-be extinct bees. Who would have thought, that after getting stung by a bee, it would propel you into stardom? But there is more to their union than meets the eye. What is the mystery behind the bee stings? Why in particular were these 5 people stung? 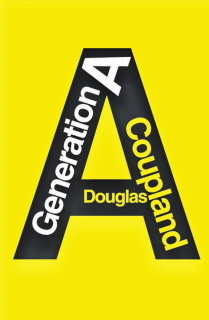 I was quite intrigued by Coupland’s style of storytelling, a good mix of drama and humour. What made it more enjoyable was the all the pop cultural references that he throws in there. Like, he takes a few pages to explain the Japanese anime, Battleship Yamato. Random, but pretty awesome (it even parallels our story). At the same time, it grounds the book in a certain generation – to ours. Would the book speak to an audience say 30 years from now? It’s hard to imagine, unless things like World of Warcraft are still relevant then. Where the book lost me was in the last third. The characters begin telling short stories, in a campfire sort of style. It goes on and on. To me, just when things started to get intriguing, it grinds to a halt. I wanted to hear about the story, not necessarily the stories within the story. I’m sure there is some message behind the sub-stories, but it just wasn’t connecting with me. For a first Coupland read, it was good, but I wanted it to be great. But I’m a very simple man. I was just looking for a straight-up conventional narrative. I’ve got Girlfriend in a Coma lying on my shelf, so I’ll give him another shot. Until then, later geeks!